WASHINGTON, D.C., Sept. 25 — Dr. Elizabeth Hausler, Founder and CEO of Build Change, delivered an impassioned TED Talk to the organization’s “We the Future” conference in New York, joining thousands of other social entrepreneurs and activists in calling for a renewed commitment to building housing resilience and battling poverty in the developing world. The marquis event at the TED World Theater in Manhattan celebrated the 73rd annual opening session of the United Nations General Assembly. Around the world, natural disasters destroy thousands of lives and erase decades of economic gains each year. These outcomes are undeniably devastating and completely preventable, Dr. Hausler said, and substandard housing is to blame. It’s estimated that one-third of the world will be living in insufficiently constructed buildings by 2030; Hausler hopes to cut those projections with a building and retrofitting revolution. 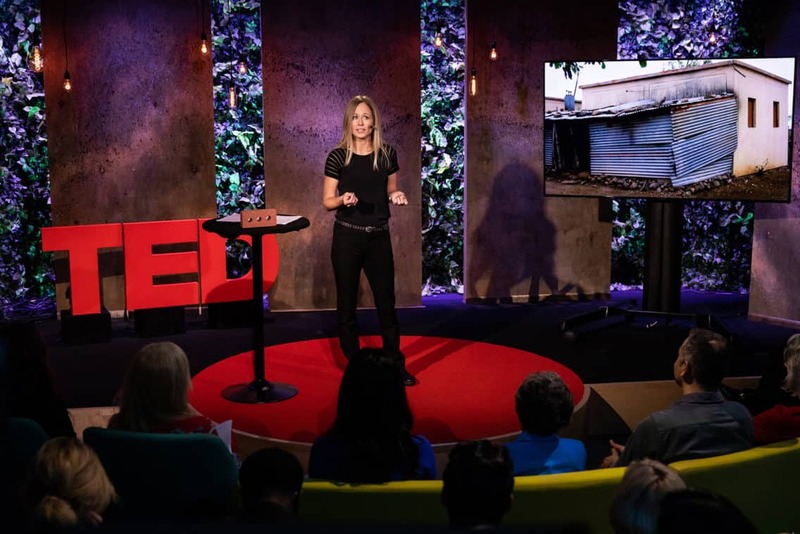 She shared six straightforward principles to approach the problem of substandard housing: teach people how to build, use local architecture, give homeowners power, provide access to financing, prevent disasters and use technology to scale. “We need to move away from looking at the persons who will live in these homes as a victim, or a beneficiary of charity, and put instead the decision-making power in their hands, in the hands of the homeowner because when we do that – especially with women head of households – amazing things, including resilience, happen,” Dr. Hausler said. “We the Future,” a day of talks at the TED World Theater, was presented in collaboration with the Skoll Foundation and the United Nations Foundation, 13 speakers and two performers explored some of our most difficult collective challenges — as well as emerging solutions and strategies for building bridges and dialogue. TED, a nonprofit dedicated to the spread of ideas, hosts the popular TED Talk videos on its website. Video talks from the September event, including Dr. Hausler’s, are expected to be released by TED before the New Year. Improving higher education in Africa. There’s a teaching and learning crisis unfolding across Africa, says Patrick Awuah, founder and president of Ashesi University. Though the continent has scaled up access to higher education, there’s been no improvement in quality or effectiveness of that education. “The way we teach is wrong for today. It is even more wrong for tomorrow, given the challenges before us,” Awuah says. So how can we change higher education for the better? Awuah suggests establishing multidisciplinary curricula that emphasize critical thinking and ethics, while also allowing for in-depth expertise. He also suggests collaboration between universities in Africa — and tapping into online learning programs. “A productive workforce, living in societies managed by ethical and effective leaders, would be good not only for Africa but for the world,” Awuah says. Songs of hardship and joy. During two musical interludes, singer-songwriter Ayọ and guitarist Marvin Dolly fill the TED World Theater with the soulful, eclectic strumming of four songs — “Boom Boom,” “What’s This All About,” “Life Is Real” and “Help Is Coming” — blending reggae, R&B and folk sounds. If every life counts, then count every life. To some, numbers are boring. But data advocate Claire Melamed says numbers are, in fact, “an issue of power and of justice.” The lives and death of millions of people worldwide happen outside the official record, Melamed says, and this lack of information leads to big problems. Without death records, for instance, it’s nearly impossible to detect epidemics until it’s too late. If we are to save lives in disease-prone regions, we must know where and when to deliver medicine — and how much. Today, technology enables us to inexpensively gather reliable data, but tech isn’t a cure-all: governments may try to keep oppressed or underserved populations invisible, or the people themselves may not trust the authorities collecting the data. But data custodians can fix this problem by building organizations, institutions and communities that can build trust. “If every life counts, we should count every life,” Melamed says. How will the US respond to the rise of China? To Harvard University political scientist Graham Allison, recent skirmishes between the US and China over trade and defense are yet another chapter unfolding in a centuries-long pattern. He’s coined the term “Thucydides’ Trap” to describe it — as he puts it, the Trap “is the dangerous dynamic that occurs when a rising power threatens to displace a ruling power.” Thucydides is viewed by many as the father of history; he chronicled the Peloponnesian Wars between a rising Athens and a ruling Sparta in the 4th century BCE (non-spoiler alert: Sparta won, but at a high price). Allison and colleagues reviewed the last 500 years and found Thucydides’ Trap 16 times — and 12 of them ended in war. Turning to present day, he notes that while the 20th century was dominated by the US, China has risen far and fast in the 21st. By 2024, for instance, China’s GDP is expected to be one-and-a-half times greater than America’s. What’s more, both countries are led by men who are determined to be on top. “Are Americans and Chinese going to let the forces of history draw us into a war that would be catastrophic to both?” Allison asks. To avoid it, he calls for “a combination of imagination, common sense and courage” to come up with solutions — referencing the Marshall Plan, the World Bank and United Nations as fresh approaches toward prosperity and peace that arose after the ravages of war. After the talk, TED curator Bruno Giussani asks Allison if he has any creative ideas to sidestep the Trap. “A long peace,” Allison says, turning again to Athens and Sparta for inspiration: during their wars, the two agreed at one point to a 30-year peace, a pause in their conflict so each could tend to their domestic affairs. Can we ever hope to reverse climate change? Researcher and strategist Chad Frischmann introduces the idea of “drawdown” — the point at which we remove more greenhouse gases from the atmosphere than we put in — as our only hope of averting climate disaster. At his think tank, he’s working to identify strategies to achieve drawdown, like increased use of renewable energy, better family planning and the intelligent disposal of HFC refrigerants, among others. But the things that will make the biggest impact, he says, are changes to food production and agriculture. The decisions we make every day about the food we grow, buy and eat are perhaps the most important contributions we could make to reversing global warming. Another focus area: better land management and rejuvenating forests and wetlands, which would expand and create carbon sinks that sequester carbon. When we move to fix global warming, we will “shift the way we do business from a system that is inherently exploitative and extractive to a ‘new normal’ that is by nature restorative and regenerative,” Frischmann says. An innovative way to help rural farmers save. While working for a microfinance company in Kenya, Anushka Ratnayake realized something big: small-scale farmers were constantly being offered loans … when what they really wanted was a safe place to save money. Collecting and storing small deposits from farmers was too difficult and expensive for banks, and research from the University of California, Berkeley shows that only 14–21 percent of farmers accept credit offers. Ratnayake found a simpler solution — using scratch-off cards that act as a layaway system. MyAgro, a nonprofit social enterprise that Ratnayake founded and leads, helps farmers save money for seeds. Farmers buy myAgro scratch cards from local stores, depositing their money into a layaway account by texting in the card’s scratch-off code. After a few months of buying the cards and saving little by little, myAgro delivers the fertilizer, seed and training they’ve paid for, directly to their farms. Following a wildly successful pilot program in Mali, MyAgro has expanded to Senegal and Tanzania and now serves more than 50,000 farmers. On this plan, rural farmers can break cycles of poverty, Ratnayake says, and instead, enter the cycle of investment and growth. A daring idea to reduce income inequality. Every newborn should enter the world with at least $25,000 in the bank. That is the basic premise of a “baby trust,” an idea conceived by economists Darrick Hamilton of The New School and William Darity of Duke University. Since 1980, inequality has been on the rise worldwide, and Hamilton says it will keep growing due to this simple fact: “It is wealth that begets more wealth.” Policymakers and the public have fallen for a few appealing but inaccurate narratives about wealth creation — that grit, education or a booming economy can move people up the ladder — and we’ve disparaged the poor for not using these forces to rise, Hamilton says. Instead, what if we gave a boost up the ladder? A baby trust would give an infant money at birth — anywhere from $500 for those born into the richest families to $60,000 for the poorest, with an average endowment of $25,000. The accounts would be managed by the government, at a guaranteed interest rate of 2 percent a year. When a child reaches adulthood, they could withdraw it for an “asset-producing activity,” such as going to college, buying a home or starting a business. If we were to implement it in the US today, a baby trust program would cost around $100 billion a year; that’s only 2 percent of annual federal expenditures and a fraction of the $500 billion that the government now spends on subsidies and credits that favor the wealthy, Hamilton says. “Inequality is primarily a structural problem, not a behavioral one,” he says, so it needs to be attacked with solutions that will change the existing structures of wealth. Nothing about us, without us. In 2013, activist Sana Mustafa and her family were forcibly evacuated from their homes and lives as a result of the Syrian civil war. While adjusting to her new reality as a refugee, and beginning to advocate for refugee rights, Mustafa found that events aimed at finding solutions weren’t including the refugees in the conversation. Alongside a group of others who had to flee their homes because of war and disaster, Mustafa founded The Network for Refugee Voices (TNRV), an initiative that amplifies the voices of refugees in policy dialogues. TNRV has worked with the United Nations High Commissioner for Refugees and other organizations to ensure that refugees are represented in important conversations about them. Including refugees in the planning process is a win-win, Mustafa says, creating more effective relief programs and giving refugees a say in shaping their lives.